Highly popular since becoming part of the CKX product line, the one-piece Sidehill suit is back for 2019 with bright colours. 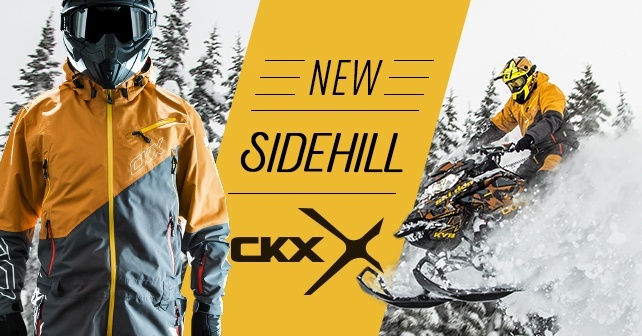 Specifically designed to meet the needs of active snowmobilers, the CKX SIDEHILL provides both freedom and performance. When assessing a performance garment, a good starting point is superior quality materials. CKX uses a breathable membrane that also prevents water, snow and wind from getting through. It allows moisture to be wicked away from inside the garment while protecting you from the elements. Its ultimate mission: to keep you warm and dry! To ensure good air circulation, the suit includes ventilation ports which can be opened or closed as needed. Located midway between the side and chest panels, they are easily accessible even if the rider has a backpack on. New for 2019: Also available in the ZERO ISOLATION line. If you are riding in mild weather, the Sidehill suit also comes in the Zero insulation version. In the Zero insulation line, the one-piece suit has no insulation. Your only protection is against water, wind and snow. For those seeking something more versatile, the suit is also available in the insulated version like the first suits. With a 60g insulation, the one-piece suit is more suited to a riding style that requires intense physical activity. If you like a more passive ride, you can add a layer with an EVO liner which will provide you with an additional 120g insulation. The design of this suit is just as important as the materials used. Designed to last, the one-piece suit has Cordura 500D reinforcements in areas where better resistance to abrasion is needed: On the inside, there is a system of adjustable and removable suspenders. For added comfort, they are padded and part of the back is meshed to maintain good breathability and avoid any areas of moisture. Their Y design also contributes to comfort as they cannot slide off the shoulders. Similarly, to also keep the sleeves in place, the suit’s inside cuffs include an opening for the thumb. The garment is also held at the bottom of the leg’s lining by a hook which attaches to the boot. Combined with the anti-skid band, there is no way the snow can penetrate the garment, even in powder snow conditions. We recommend pairing the CKX SideHill with the TITAN helmet. You can find more information about the TITAN here.